While trying to discover a way to calculate the digits of Pi faster with the Leibniz formula for Pi, I noticed that, if I took two consecuent numbers in the series, and calculate their average, I would get a number incredibly closer to Pi compared to these other two numbers, and furthermore, if I took another consecuent two of these averaged values and, redundantly, average them, again the result would be closer to Pi. To understand it more, its like a tree of averages, where the original series is at the bottom, then, every two consecuent terms of the series will have a child, which is their averages. These childs will make another infinite series that converges faster to Pi in the same manner the Leibniz series do(that means bouncing up and down from Pi until slowly stopping into it, like a guitar chord resonating until it stops), so for these childs too we'll calculate the average of each two consecuent terms, and make another child series out of those new childs. This process will repeat until the final series results in only having one final child at the top of the tree, which means we can't average anymore since we need two terms to do so, meaning that that last child is the closest to Pi that this algorithm, if it can be said that way, can get. For this purpose I have made the following program, it functions with two threads called PiLoopThread and DisplayThread (named that way after my C++ Leibniz series calculator intent), in which the first is in charge of calculating Pi and its averages subseries, and the other of displaying information about the calculations and basically what's going on from time to time. At the start the program first sets up the UI, and then starts the two before mentioned threads. The methods where the magic happens are nextCicle() and updateAverages(). 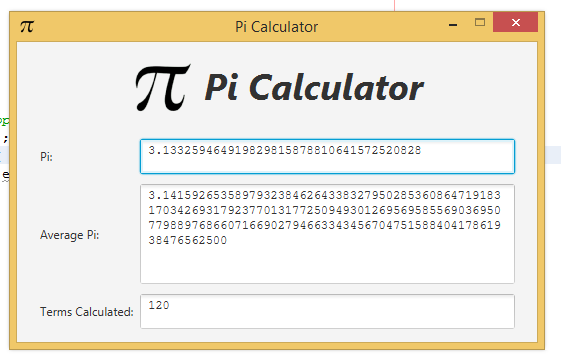 nextCicle() is in charge of updating PI, LastPI (for calculating the average), and the cicle Count. updateAverages() updates the averages tree by using an ArrayList of all the previous "top-most childs". It first appends the average of PI and LastPI at the end of the ArrayList ( i = listSize - 1 ), then if there is a previous element from that element ( i--; i >= 0 ), it becomes the average of those both elements (list.set( i , average( list.get(i), list.get(i+1) ) )), and that continues until there are no more previous elements to reaverage ( i >= 0 equals false ). That's made that way so the BigDecimals to store during the life of the program are the minimum. -Note: nextCicle() is executed in a loop that looks like the following pseudocode: "while !shouldStop do nextCicle() and then sleep for 1ms". // This function calculates the next PI in the series, as well as the actual child series while creating other news (see updateAverage()). // This function works by calculating ONLY the averages at the last side of the tree. // top of the tree, or in this case, while the index is more or equal than 0. As you can see, it managed to get Pi with just averaging right up to the 34th digit in just 120 Leibniz term calculations that just took less than 1 sec, so, yeah, wow. You can download the jar from here. If you want the full source code ( plus the .jar ) you can download it from here too for the NetBeans IDE. Firstly, why are the variables deliberately placed in a different scope to the code which operates on them? Secondly, why are they static? For that matter, why is everything in BDFuncs static? Thirdly, why the inconsistency in the capitalisation? ALL_CAPS in Java convention is reserved for constants; other fields should be in lowerCamelCase. FWIW the correct spelling is cycle. Why .plus()? That method literally does nothing. Why doesn't the term include its sign, so that you always add? That would be more mathematically coherent and would make it easier to understand the code because it would remove the requirement to call the methods in the right order. This seems like the appropriate place to ask why Count is a BigDecimal rather than just an int. If you want to minimise the errors then as a rule of thumb you should add the terms in increasing size, i.e. starting with the last one. This is a problem for iterative refinement: serious calculation would not just iterative refinement. It's not clear to me from reading the code that it actually has the same tree structure as defined in the question. Comments giving the invariants might clarify this - or maybe it is not, in fact, the case. Not the answer you're looking for? Browse other questions tagged java numerical-methods or ask your own question.